Our Trade Summit is a one-of-a-kind event which provides a forum for business leaders, trade practitioners and public leaders to learn from expert speakers and other attendees in their fields. Our Morning Keynote "The Changing Face of Global Commerce" - Kenneth E. Hyatt, U.S. Department of Commerce Acting Under Secretary for International Trade will set the stage a series of round tables where attendees offer their own insights on possible solutions to the challenges facing today's importers & exporters and make recommendations on how Kentucky can accelerate trade and attract investment from abroad. You will also have an opportunity to hear from Kentucky Governor Matt Bevin (invited) as he returns to the stage at our Awards Luncheon while our Luncheon Keynote "Kentucky Aerospace - Launch Pad for Workforce Development" - Philippe Garnier, CEO & General Manager of Safran Landing Systems (formerly Messier-Bugatti-Dowty USA) will offer commentary on changing face of workforce development in of today's global landscape. The Kentucky International Trade Summit draws an international crowd; our attendees represent some of the state's most important and influential corporate leaders, small business owners, trade professionals, educators, political figures, medium sized businesses, innovators and more. The mission of the Kentucky International Trade Summit is to accelerate trade and economic development through innovation and connectivity. We have all industries represented from manufacturing to wholesale and franchise trade, or from the automotive sector to agriculture. If you're looking to make an impact with the best and brightest businesses in the state, look no further. 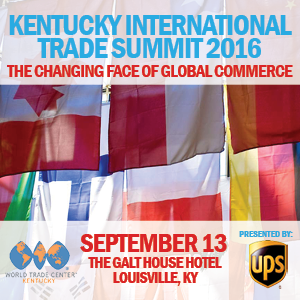 "The Changing Face of Global Commerce"
Kentucky Distric Export Council Inc. Call 1-800-THE-GALT (1-800-843-4258) for reservations and mention - TRADE SUMMIT for select rates available through August 29, 2016.